On Sep 7, 2011 Mats Lewan of Nyteknik ran another trial, on a new eCat, which will reportedly be used in the 1MW Unit. The new model was significantly larger and heavier than the previous ones. It measured about 50 x 60 x 30 centimeters and weighed about 80 kg when empty of water. Consequently it is not as easy as before to rule out alternative sources of energy inside the E-cat, especially from a relatively short test as the one we undertook. Note that the power level "5 to 9" actually increases in half-steps (indicated by a DOT next to the number 0 ...9.) It is not clear if Lewan's reports noted this. The final "9-DOT" value was full power. For other settings power estimates are only approximate, because the exact duty cycle wasn't measured. Unlike earlier eCats, when the Reactor "Ignited" at an output temperature of about 60C, this eCat appears to ramp up in power (even after the heating resistor is fully on) and then, when the input power is turned off, it ramps down again. This could possibly be explained by a large thermal mass, but the author does not think this is likely. (See Vortex for extensive discussions). The maximum temperature at the input port before the power was turned off was 131.9 C at 22:30. But no measurement of output fluid flow was made at that time. Conveniently, this is also close to the temperature 122.7C at 23:10, when the reactor was stopped by discharging the hydrogen and draining the eCat. My initial thoughts were that it is probably more like a Kettle Boiler than a Tube boiler. The outlet port is very high on the unit ... if it was just the overflow from a kettle boiler then there wouldn't be any room for steam. I might have to go back to thinking of it as a Tube boiler, where the flow of the steam carries the water with it. But in the early stages of the process the overflow water clearly pulses, just a fraction of a second later than the sound of the pump. That implies it's directly connected to the incoming water. It's a kettle again. I'm still trying to figure out what's going on! How does it get 118C at the instrument port and 50% fluid water at the outlet? The steam quality is 0.2 (ie 20% Dry). 50% comes out as fluid water. So the gas component has to be composed of 40% vapour and 60% drops. The author's "Steam Analysis" shows that this is unlikely, for either a Kettle Boiler or a Tube Boiler. Since the output water temperature wasn't measured the fluid water could be bypassed with a Tarallo Fake. If only half the water is passed through the core this would give an output steam quality of 0.6 (Vapour and Droplets) -- but the output water temperature would then be only 20C. It wasn't measured. 4.2. The internal pressure is 2 Bars, quality is 0.5. The water and the steam are in equilibrium at 118C. As the 118C steam leaves the system the pressure drops to 1 Bar and the temperature drops to 100C (adiabatic expansion -- a vertical line on the temperature-enthalpy diagram) -- and it might start condensing. But the 118C water would probably flash into steam, and in the process cool down to 100C. So do we end up with MORE or LESS water than we had inside the eCat? This model requires an internal pressure of 2 Bar (or 3 Bar for the maximum observed temperature). This would require a restrictor orifice at the outlet of approximately 2 mm radius. 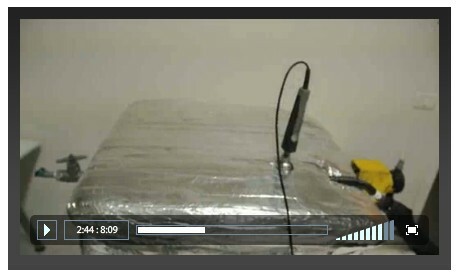 In this case, the only way you can reach 118C is for ALL the water to evaporate, and for the steam to be super-heated. The 118C 100% Dry superheated steam leaves the eCat. But to get the observed 50% fluid water, this has to cool and condense in about 10cm. I don't think you can get rid of enough heat that quickly : to condense, it needs nucleation sites, which will be available only on the wall of the tube. Rick Cantwell's simulated Rossi reactor showed little or no condensation even through a 3m hose. The first chamber is a kettle boiler at 100C (1 Bar). Any excess fluid overflows directly, at 100C. The steam component then goes into a second chamber, where it is superheated to 118C at 1 Bar. Because it is a separate chamber it does not have to be in equilibrium with the water. According to Andrea Rossi the increased dimension is due to a larger volume inside where the water is heated, approximately 30 liters, and a larger heat-exchanger with a greater surface which should result in a more effective heat transfer from the reactor to the circulating water and also in additional heating of the steam after vaporization. In other words, it includes a superheater. Note : this separation of boiler and superheater is very common in traditional boiler design. This 118C steam also exits through the hose, and may (but need not) cool and condense. It does not have time to reach equilibrium with the 100C overflow fluid over the 10cm distance. The main reason I DON'T like this is that the outlet is so high on the eCat. If this is the case then at 130C the fluid water could still be flowing out at the same rate as for 118C. From the measured input flow and the time it takes for the water to overflow (before the reactor was started) we know that the liquid volume is about 25L, leaving about 5L for the steam chamber. The 27MW e-cats are single core or do they have multiple cores? In this case the eCat remains a Tube Boiler, not a kettle, and there is no mechanism for overflow which allows 100C water to overflow separately from 118C superheated steam. The temperature of 118.8C and 50% fluid overflow is most consistent with an internal operating pressure of 2 Bar, and a steam quality of 50%. According to my "steam" hypothesis, the eCat is operating below dryout point, which I estimate to occur at 75% Dry. However, this conflicts with Rossi's statement that there is no constriction in the outlet. If there IS a pressure drop between the inside and outside of the eCat, how could it occur? Napier's formula (accurate to about 3%) for steam going through an orifice in a flat plate, to atmospheric pressure. To get a 1 Bar drop at 11 kg/hr the orifice radius is 0.26 cm. Aside : would the orifice block the flow of water at start-up? Water 2 cm deep could overflow through this 0.18 orifice at 23.274 kg/hr, so there is no problem at "start-up". (Using flow = 8 A sqrt(h) -- flow in cubic feet/sec, Area A in square feet, depth h in feet -- converted to kg/hr and cm). The flow is 11 kg/hr (assuming all gas) -- so the pressure drop would be 0.0009 Bars. It therefore seems unlikely that an internal pressure much above 1 Bar would be created "accidentally" inside the eCat. Rossi states that there is no constriction to the outlet. I can't figure out the "dumping" of the water at the end, either. Is it 100C water, or is it 120C water? 1 Bar or 2 Bars ? I've never seen 22L of boiling water dumped through a tap, so I don't know what it should look like. It does appear to come out under pressure, and it does seem to flash to steam at the edge of the stream -- both supporting evidence for an internal pressure of 2 Bars. 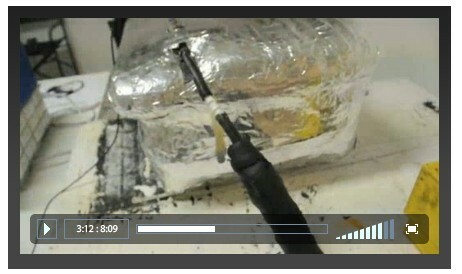 The video ends before the discharge is complete. 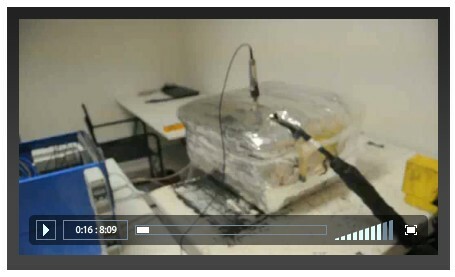 The time shown on the video (6:44 to 8:06) is 1.33 minutes, but the water flow is still running quite strongly at the end. 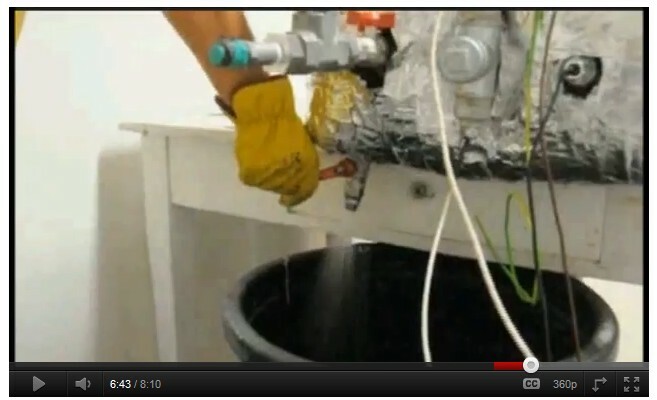 At 7:36 in the video (52 secs after draining starts) the plumber adjusts the tap slightly, possibly to open it a little. Mats Lewan says that his video cut off prematurely, but he thinks the total emptying time was about 3 minutes. Where A is the area of the tank, a is the area of the orifice, and H is the depth (Initial and Final). C is a constant which depends on the nature of the orifice (set to its maximum value, 1, although a tap is more restrictive and would have a lower value.) g is earth’s gravity. The drain is at a depth of 25 cm (based on the dimensions of 60 x 50 x 30 cm) and 22 liters was drained (measured by Lewan). The radius of the outlet tap is at most 0.5 cm. The tap appears to be a ball valve (thanks to Mark Iverson) at about 30 to 35 degs from the perpendicular, which is slightly less than half open. 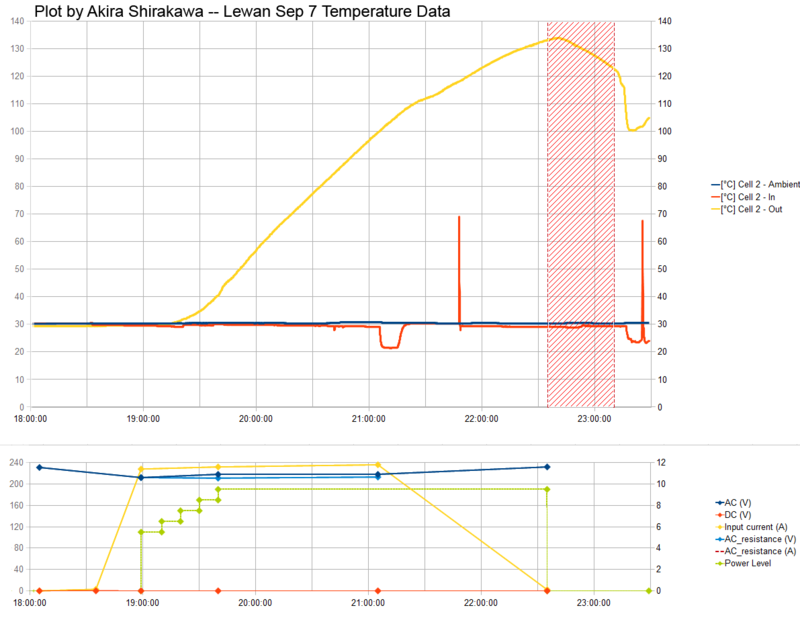 Jouni Valkonen wrote on Vortex: "Considering Akira's temperature graph, we can take that draining took about 5-7 min" (about 23:15 to 23:22 in the log). Since the top outlet is still open (through the hose) cool air will be sucked past the temperature probe, and the temperature drops rapidly. When it's completely drained this flow will slow and stop, and the thermal mass will cause the air inside to heat up again. Since the video only showed 1.33 minutes out of a total of 7 minutes (from the temperature data), no great drop-off in flow can be expected. A 7-minute draining time is probably more consistent with a 1 Bar pressure. The 1.33 minute video is more consistent with 2 Bars. But a 3-minute draining time is right on the margin! Since the draining-time formula is for a clean, circular aperture (the factor C in the formula), and since it has to drain through the eCat, a section of pipe and the tap, the effective aperture is probably much smaller than the actual aperture. Even a short tube (length 2.5 diameter) reduces the effective aperture size by 0.6 -- making the 2 Bar scenario the favourite again. b) Temperature of the overflow fluid water -- should be 100C (it would only be 50C for a 50% Tarallo fake). d) The rate of overflow fluid flow at regular intervals. The T-junction water trap was available, but not used.